Ruth has also put pressure on Catering and the Administration Committee to reduce the use of non-recyclable disposable coffee cups in Parliament. The campaign 'Plastic Free Parliament' estimates that The House of Commons and House of Lords used over 2 million avoidable single-use plastic items in 2017. All of which could be easily replaced with sustainable alternatives. The committee will now consider actions to reduce plastic waste at their next meeting in March. Ruth Cadbury said: "I am delighted to join the Pass on Plastic and Plastic Free Parliament campaigns. It is deeply worrying that there are 5 trillion pieces of plastic in the world's oceans, with 8 million tonnes more ending up there every year. We all have a role to play in protecting our oceans - that's why I have signed my pledge to #PassOnPlastic and encourage others to do the same." "We can all do our bit - I've bought re-useable cups with lids for me and my team to take to the coffee shop in Parliament, to cut down on the use of non-recyclable single-use cups." Launched in January 2017, Sky Ocean Rescue aims to shine a spotlight on the issues of ocean health, particularly single-use plastic, and inspire people to make small changes. The #PassOnPlastic pledge was also signed by 113 MPs, all making a public commitment to reduce their consumption of single-use plastics. 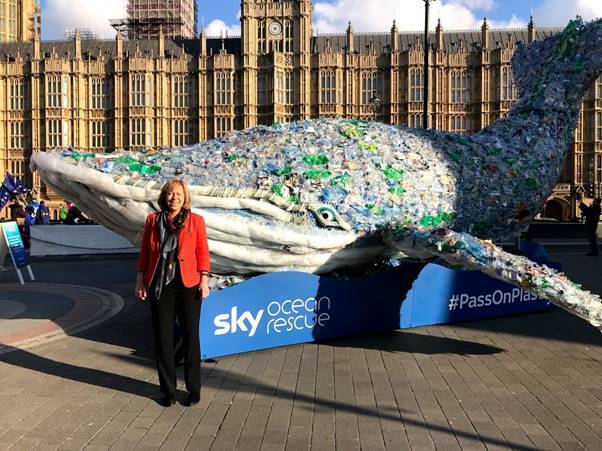 Sky Ocean Rescue's whale, Plasticus, which is made up of a quarter of a ton of plastic - the amount that enters our oceans every second - arrived outside Parliament to bring to life the scale of the problem.